A Unicef NextGen London exhibition presenting new photography exploring global migration, by eight international photographers. Polaroid photos by eight international photographers exploring global migration – the small scale of the instant analogue prints requires the viewer to engage closely with the content. Monday 18 June 5-7pm - Cyrus Mahboubian (one of the artists who worked on the exhibition) will join us for an introduction. Complimentary drinks will be served! Please RSVP to oli@artreach.biz to confirm your place. If you would like to bring along colleagues do let Oli know. As part of the programme of events, Journeys Festival International invites you to join us for an informal evening discusssion with some of the artists involved with the project. The project’s co-founder Cyrus Mahboubian will be joined by photographer Tom Skipp to discuss the exhibition, as well as answer any questions about MIGRATE. Booking is essential to ensure your place. Complimentary drinks will be served. Saturday 23 June with Polaroid Lift workshop by Leicester LoFi, 11am-2pm. Booking is essential to ensure your place. 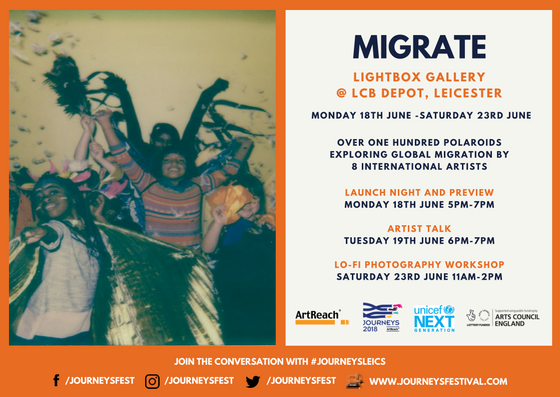 MIGRATE at LCB Depot is an LCB Depot/Artreach/Journeys Festival International collaboration. Journeys Festival International celebrates the creative talent of exceptional refugee and asylum seekers artists and shares the refugee experience through great art and culture.